Campaign is a London based design and architecture studio founded by Philip Handford to push the boundaries of consumer experience. The studio is hands-on in exploring different media and methods in order to tell unique and engaging brand stories, developing integrated brand experiences through interior architecture and graphic design. 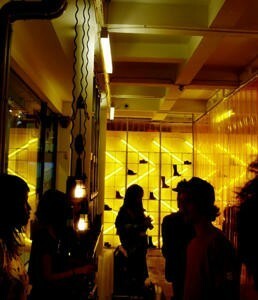 The concept behind the Dr Martens pop-up store in Spitalfields, London is fundamentally inspired by Dr. Martens’ heritage. The interior of the new Dr. Martens resembles that of a warehouse, a building type that’s been used for temporary retail spaces earlier. Campaign designed the store with a no frills aesthetic using inexpensive industrial materials, readily available and quick-to-assemble to capture the attitude and heritage of Dr Martens that catapulted it from a working-class essential to a counter-cultural icon. The store is designed in a lo-fi way with flexibility in mind; the store interior is easily modified to allow the stores to be changed at a very minimal cost on a regular basis. The location of the yellow dividing PVC curtain can be changed on a ceiling grid to divide the space differently, a device which changes the flow of the store and therefore helps keep the local & returning customer engaged.